I have been thinking about planting potatoes, but I am not sure how to plant potatoes or when I can plant. What are the basics? 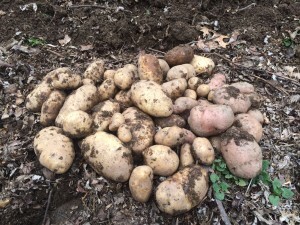 Some folks consider potatoes a very basic and unexciting crop that doesn’t deserve placement in the high-dollar real estate of their garden beds. BUT, when you harvest your first potato crop, you will quickly realize that store bought potatoes can never compete with the flavor-packed earthiness of a just-dug potato. Whether fresh-dug, new potatoes, or stored-for-winter potatoes, I have a great affection for this humble and versatile root crop! Growing your own potatoes is a fabulous idea because potatoes are #12 on the Dirty Dozen List. Environmental Working Group’s (EWG) 2015 Shopper’s Guide to Pesticides and Produce measures pesticide residues in produce and rates them accordingly. EWG states that “The average [conventional] potato had more pesticides by weight than any other food.” What is the obvious solution? GROW YOUR OWN – organically! (or buy them from a local organic farmer). A QUICK HISTORY: Potatoes have a rich history, originating in the Andes Mountains of South America where over 4000 edible potato varieties have been preserved by the Centro Internacional De La Papa in Peru. By the mid-1500’s the Spaniards began importing potatoes to parts of Europe, and just three centuries later, potatoes had become a large scale mono-crop and important food source for much of the Western world. In the mid-1800s the potato crop was devastated by Potato Late Blight causing massive crop failures. During the years of the Great Famine in Ireland, over one million people died of starvation. Consequently, plant breeders utilized heirloom Peruvian potato stock to breed more blight resistance and genetic diversity back into potato stock. Potatoes have gone global, and have become the world’s fifth most important crop. They are found in most cultures, including China whose population is highly dependent on potatoes. Most of us associate a favorite potato dish with comfort food…French fries, mashed potatoes, potato soup, potato salad, potatoes au gratin, potato latkes, or plain-ole baked potatoes. 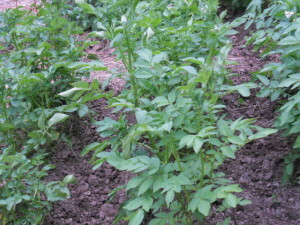 The green foliage of a potato plant. PREPARING POTATO SEED FOR PLANTING: A Potato “seed” is made by cutting whole potatoes up into egg-size chunks that contain a couple of nice “eyes”. Once you have cut up the potatoes, you can plant them right away. Alternatively, wait to plant and spread the potatoes out in a dry spot for a day or so and allow them to scab over, or dust the potatoes with agricultural lime. This helps prevent rotting in the ground. You will get 8-10 potato “seeds” per pound of potatoes (and twice as many for fingerling potatoes). Always start with certified seed potatoes, so that you know your potatoes are disease-free – found at your local garden center, at local seed stores, and at farm supply stores. Buy ORGANIC certified seed potatoes if possible. HOW TO PLANT POTATOES: Plant potatoes in full sun, in well-drained soil that is rich in organic matter. 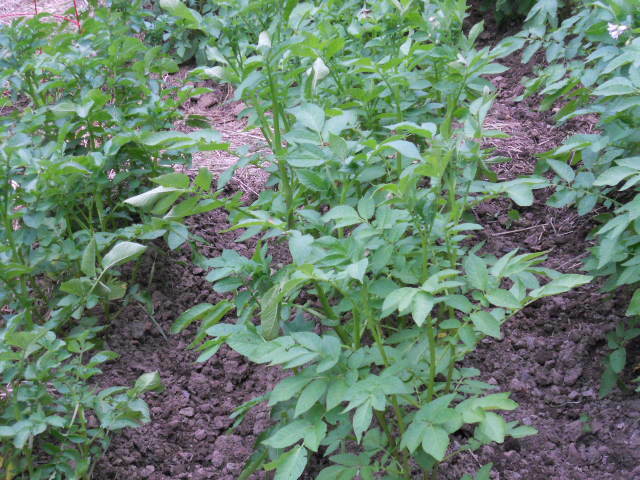 Potatoes are heavy feeders, so foliar feed with liquid fish hydrolysate/seaweed (like Neptune’s Harvest) 4-6 times during the growing season and/or side-dress with organic fertilizer as needed. Prepare seed and then plant potatoes 3-4” deep and 12” apart in rows that are 3-4 feet apart. Plant fingerling potatoes 15-18” apart. I usually cut a trench with my hoe, place the potatoes in the trench with the eyes facing up, and then use my hoe to pull soil back on top of the potatoes. After covering, I gently tamp the soil down with the flat bottom of the hoe. The plants will come up in 2-3 weeks. You will need to “hill up” the potatoes once they are about 8-12” tall. Do this with your hoe by pulling soil from each side of the row and up on the potato plants – cover about 2/3 of the plant with soil. This will keep the baby potatoes from greening (potatoes exposed to sun will turn green and become bitter & toxic) and will also keep the ground softer where the potatoes are forming and increase your yield. “Hill up” again when the plant is another 6” taller, and optionally one more time after that. Alternatively, you can apply a THICK wheat-straw mulch to the ground around the potatoes. You can also plant potatoes in a container, adding soil or straw as the plant grows. Use high quality potting soil for planting, and be sure that the container is well-drained. Potatoes will rot in soggy soil. WHEN TO PLANT POTATOES: Most sources suggest planting potatoes two weeks before the last frost. That would be toward the end of April in the Southern Appalachians, but I like planting potatoes as early as possible…even in early March. Planting in early March does come with a risk – if the weather turns cold and wet, your potatoes may rot in the ground and you will have to replant. On the flip side…the later you plant, the more you risk crop loss to late blight. Karen Thatcher of Thatchmore Farm remembers her grandparents planting in March on the dark of the moon (after the full moon and before the new moon). Like Karen, scientific or not, I usually time my potato planting according to the moon and try to plant in the third quarter. But, I have also planted in late May whenever I could find the time – without regard for the signs. Local lore suggests planting potatoes on or before Good Friday – the Friday before Easter. Factoid: Easter is the first Sunday following the full moon that falls on or after the Spring Equinox. WATER: Potatoes require one inch of water per week. Drought conditions will compromise your yield, so remember to water when needed. Be aware that container-planted potatoes can dry out quickly, so be sweet to your plants and keep your eye on moisture levels. HARVEST & STORAGE: Check for “new potatoes” when your potatoes flower. Dig up a whole plant, or gently dig around the roots and harvest a few new potatoes for supper – without disturbing most of the plant. Be sure to re-cover the plant roots with soil so the unharvested potatoes don’t turn green. Closer to fall, about two weeks after the plants start to turn brown and die back, it is time to dig your crop. It is best to wait until the ground is not super-wet, and refrain from watering the potatoes for a week or so prior to harvest to toughen up the skins. Use a potato fork or stout garden fork for harvesting (not a pitchfork). Starting about a foot out from the plant’s center, push your fork down deeply into the soil and then press back on the fork loosening the roots. I cautiously work in a circle around the plant hoping not to injure any potatoes. Gloves are helpful for digging around to find every last potato. Let the potatoes dry a few hours before curing them, protecting them from sunlight (sunlight could cause greening). Examine the potatoes closely and cull out any suspicious, spoiling, or cut potatoes. Eat any damaged potatoes right away. You don’t need to clean potatoes before storage, but you might want to knock off any big chunks of soil. Cure for about 1 ½ weeks in a warm, humid, and dark place allowing the skin to toughen up and minor bruises to heal. Then store your potatoes is a cool (not freezing) dark place. I like to store them in a breathable container like a sturdy cardboard box or brown grocery bags. Colorado Potato Beetle – This beetle is the most pressing problem in Western North Carolina, but easy to control with hand-picking. 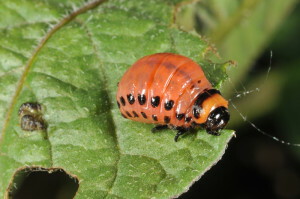 Scout for Colorado potato beetle and squash their eggs, larvae, and the beetles (or drop into a jar of soapy water). You can also use lightweight floating row cover or a thick layer of mulch to help suppress beetles. See photos below for examples. 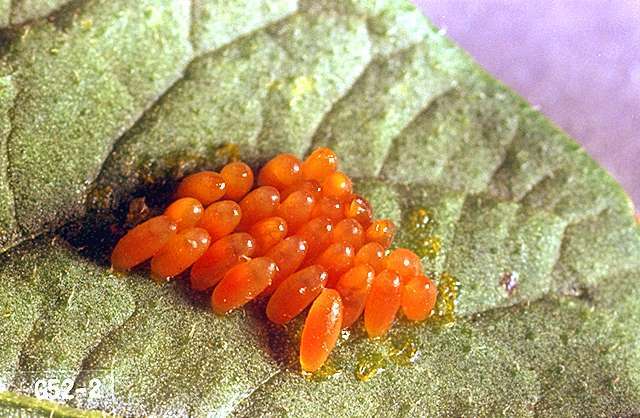 Eggs from the Colorado Potato Beetle. Colorado Potato Beetle Larva, c/o Purdue Extension. 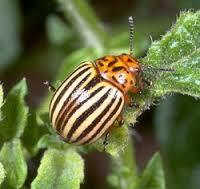 Colorado Potato Beetle c/o University of Kentucky Extension. Late blight – I have never actually had trouble with this on potatoes, but all of us have had to contend with late blight on tomatoes. Unfortunately, I hear that potato blight is getting bad in nearby Tennessee. 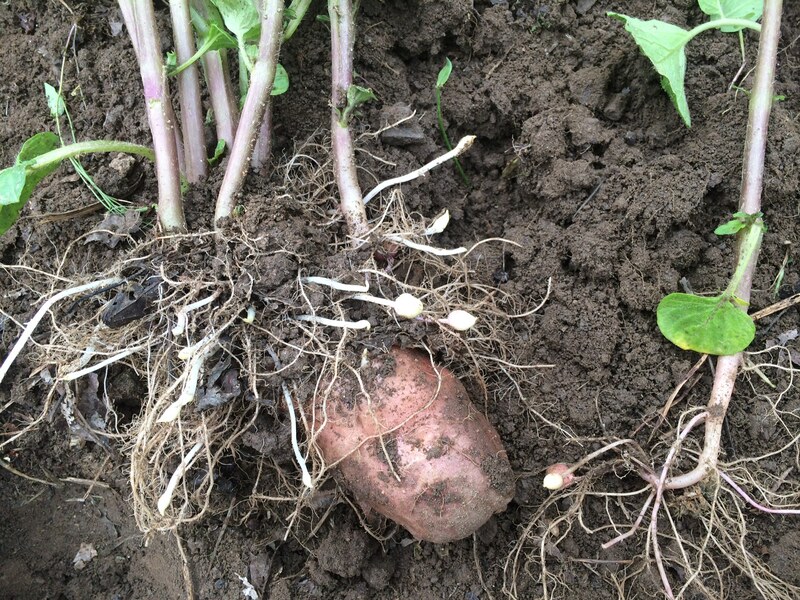 As a preventative, pull up any and all volunteer potatoes in spring (and remove from property). Adequately space plants to promote good air movement between plants, between rows, and in and around the garden. Water at base of plant (keep leaves dry), and maintain good air movement in your garden. Serenade and copper can help prevent late blight of potato. Scab – Scab is more of a cosmetic issue for the home grower and does not usually decrease yields. Plant scab-resistant varieties such as Yukon Gold, Red Norland, Carola, and Chieftain. Wireworms – Most prevalent in ground that was previously sod (ie. recently turned). For more info on organic potato production, see this massive 104 page document on organic potatoes. POTATO VARIETIES: Potatoes come in many colors, shapes, and textures – with skin and flesh colors ranging from purple, red, yellow, brown, and white. If you can’t decide which potatoes to plant, sample some of the diverse cultivars found in our local Tailgate Markets. Kennebec – (Late) Great all-purpose potato, brown skin, white flesh. This is THE standard WNC mountain variety that all the old timers plant. Stores well. Yukon Gold – (Early-mid) Brown skin, yellow flesh, stores well. Naturally buttery and my favorite! Red Pontiac/Red Norland – (Early) Red skin, white flesh. Great “new” potatoes, boiling, salads. Not a great long-storage potato, but delicious. All Blue – (Early-mid) Blue/purple skin and flesh. Beautiful in potato salads/soups (with skin on). French Fingerling – (Mid-late) Rosy skin, yellow flesh. Gourmet quality. Beautiful in salads/winter soups (with skin on). Stores well. I love fingerlings! Oliver…home grown potatoes are SO yummy and satisfying. You still have time to get them in the ground this year, so go for it! Ruth Gonzalez is a former market farmer, gardener, and local food advocate and blogger at Tailgate Market Fan Club. In her job at Reems Creek Nursery, Ruth offers advice on all sorts of gardening questions, and benefits daily from the wisdom of local gardeners.